A long term care annuity is a type of hybrid long term care insurance. By definition it’s an annuity with a long term care rider. These hybrid long term care annuities have gained significant popularity in recent years. Long term care annuities may be called hybrid annuity long term care, asset based long term care annuities, or hybrid long term care insurance. The term asset based comes from the LTC annuity being funded with assets rather than ongoing premiums. If you have assets to fund a hybrid annuity there can be significant advantages. Linked benefit long term care plans is also a synonymous term for hybrid annuity long term care products. Linked benefit refers to the long term care insurance being linked as a rider with the annuity. Long term care annuity policies combine an annuity with a long term care rider. This hybrid long term care insurance policy creates a pool of money to cover long term care costs. An annuity with long term care benefits includes the advantages of a traditional annuity, plus protection from long term care costs. A popular way to fund a long term care annuity is to reposition an existing annuity or other asset. For example, bank CDs, savings, annuities, life insurance, IRAs or retirement plans. You may be able to increase your current return while protecting yourself with tax-free long term care benefits. No Premium Increases – A long term care annuity can be funded with a single premium payment. This gives you the benefit of never having to be concerned about future premium increases. With traditional LTC insurance, guaranteed level premiums are typically not available. Knowing you will never have premium increases can be a significant advantage of hybrid long term care insurance. And avoiding unexpected premium increases can provide peace of mind beyond your long term care protection. Tax-Free Withdrawals – Tax-free annuity withdrawals for long term care expenses can be a significant advantage with a long term care annuity. The tax free nature of a long term care annuity will depend on the product and your personal situation. We’ll give you a hybrid annuity recommendation and refer you to your tax adviser for confirmation. Simplified Health Requirements – Hybrid annuity long term care policies may have less stringent underwriting criteria compared to traditional LTC insurance. This can make a hybrid annuity long term care policy a great fit for someone unable to health qualify for traditional long term care insurance. Health requirements vary by company. 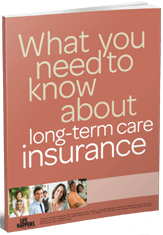 Premiums Invested Are Not Lost – Unlike traditional long term care insurance, premiums invested are not lost if you don’t use your long term care benefits. As independent insurance brokers we impartially shop the market for the best long term care annuity policies. We provide detailed long term care annuity quotes and help you compare the companies and plan options side by side. The State Life Insurance Company, a OneAmerica Company, offers several hybrid LTC annuity policies. These hybrid long term care annuities allow you to better use assets you may have designated for long term care costs. For instance, you can use the hybrid annuity’s value to cover your first few years of care and then protect yourself beyond that with an optional coverage extension. Access to your long term care benefits can even be income tax-free. Global Atlantic Financial Group offers the ForeCare fixed annuity that includes a long term care benefit. This hybrid annuity LTC insurance policy can protect you should you suffer a health event requiring long term care. With the Gobal Atlantic ForeCare annuity, you get all the benefits of a fixed annuity, such as income options, tax-deferral and a death benefit that passes any remaining contract value to your named beneficiary at death. And you get financial protection at two or three times the contract value for long term care costs.